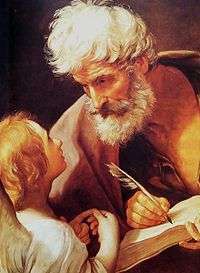 Saint Matthew the Apostle, depicted with an angel, is the patron saint of Salerno, Italy, bankers, and tax collectors. 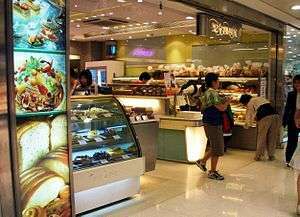 A branch of Saint Honore Cake Shop, a Hong Kong chain bakery, in Hong Kong. Saint Honorius (Honoré) is the patron saint of bakers and confectioners. A patron saint, patroness saint, patron hallow or heavenly protector is a saint who in Roman Catholicism and Eastern Orthodoxy is regarded as the heavenly advocate of a nation, place, craft, activity, class, clan, family or person. Catholics believe that patron saints, having already transcended to the metaphysical, are able to intercede effectively for the needs of their special charges. Saints become the patrons of places where they were born or had been active. However, there were cases in Medieval Europe where a city which grew to prominence and transferred to its cathedral the remains or some relics of a famous saint who had lived and was buried elsewhere, and made him or her the city's patron saint – such a practice conferring considerable prestige on the city concerned. In Latin America and the Philippines, Spanish and Portuguese explorers often named a location for the saint on whose feast or commemoration they first visited the place, with that Saint naturally becoming the area's patron. The veneration or "commemoration" and recognition of patron saints or saints in general is found in Roman Catholicism, Eastern Catholicism, Eastern Orthodoxy, Oriental Orthodoxy, Lutheranism and Anglicanism. It is, however, generally discouraged in branches of Protestantism such as Calvinism, where the practice is considered a form of idolatry. ↑ Slocum, Robert Boak; Armentrout, Donald S. (1999). An Episcopal Dictionary of the Church: A User-Friendly Reference for Episcopalians. Church Publishing, Inc. ISBN 0898692113. Retrieved 3 November 2012. ↑ The American Heritage Dictionary of the English Language, Fourth Edition Copyright, Houghton Mifflin Company. ↑ Gibson, Henry (Reverand (sic)) (1882), Catechism Made Easy: Being a Familiar Explanation of the Catechism of Christian Doctrine, No. 2, 2nd edition, Vol. 1, Chapter 5, in the subpart "The First Commandment (Concluded)", "Twenty-Fifth Instruction", p. 310, Burns and Oates (publisher), London, 1882. ↑ Duke, AC "Calvinism in Europe, 1540-1610, A collection of Documents" P. 53. Henry Parkinson (1913). "Patron Saints". In Herbermann, Charles. Catholic Encyclopedia. New York: Robert Appleton Company. "Patron Saint". Encyclopedia Americana. 1920. This article is issued from Wikipedia - version of the 11/27/2016. The text is available under the Creative Commons Attribution/Share Alike but additional terms may apply for the media files.